have decided to conclude this Convention, with the aim of the full development of the human person and the good of the country. ― The rights of a person as a citizen and a member of a religious community have their roots in the dignity and subjectivity of the human person and consequently society as a whole, and respect for these attributes leads to a sense of being an active part of the community and the country. ― Every person has the right to manifest individually or jointly with others, in private or in public, his religion or belief, with consideration for security and public order, health, public morals or the fundamental rights and freedoms of others. 1. The People's Republic of Poland states that it is a secular (non-confessional) state [świeckim (niekonfesyjnym), also used in the 1952 Constitution of Poland] that guarantees the freedom of philosophical outlook and religious beliefs. 2. The Holy See recognizes this secular character of the People's Republic of Poland. The Catholic Church, in accordance with its doctrine, teaches respect for the law and state authority and co-operates with the State for the good of the human person, for the benefit of the country and for peace. 1. The People's Republic of Poland guarantees freedom of the Catholic Church to perform its mission of teaching, priesthood and pastoral work. 2. The Catholic Church, in the performance of its mission, respects the principle of freedom of religion or belief and other constitutional principles of the Polish People's Republic. 3. The Catholic Church in Poland conducts its affairs in conformity to its own law [Canon Law], and is free to exercise its spiritual and jurisdictional authority and administers its own affairs. The People's Republic of Poland shall ensure that the Catholic Church in Poland enjoys free mutual contact with the Holy See and the individual churches, as well as with other communities, institutions and religious organisations. 1. In order to maintain friendly relations between the People's Republic of Poland and the Holy See the Contracting Parties shall establish diplomatic relations. 2. An Apostolic Nuncio (Pronuncio) will be accredited to the Council of State of the People's Republic of Poland, and an Ambassador Extraordinary and Plenipotentiary of the People's Republic of Poland will be accredited to the Holy See. 1. The People's Republic of Poland recognises the due and traditionally respected legal personality of the Catholic Church in Poland. [Poland] also recognises the Church's legal persons belonging to those categories, whose a list of will be specified in the law referred to in Article 22. 2. Newly-formed units of the church acquire legal personality, if they belong to a category referred to in paragraph. 1. 1. The People's Republic of Poland guarantees the Catholic Church freedom of worship of within the meaning of Article 1 of the Convention. 3. The Catholic Church enjoys freedom of publication and dissemination of the Bible, liturgical books and documents of the Holy See concerning faith, morality and management of the Church. The issue of staffing of Church vacancies. (This Article is reserved for direct negotiations between the Government of the People's Republic of Poland and the Holy See. 1. The People's Republic of Poland recognizes the right of the Catholic Church to establish, abolish, alter and manage Institutes of Consecrated Life and Associations of Apostolic Life. They act in accordance with their statutes. They can be headed only by Polish citizens. Departure from this principle requires the consent of the Polish authorities. 2. Creating in the Polish People's Republic of Institutes of Consecrated Life and Societies of Apostolic Life is the remit of the competent spiritual authority. 3. Creation of a branch of an institute or an association that exists abroad, and has not yet been active in the Polish People's Republic requires consultation by the relevant representative of the Catholic Church in Poland with the relevant state authorities. 1. The People's Republic of Poland will continue to enable the Catholic Church in Poland to conduct missionary and Polish ministry ["soul-shepherding" for Poles abroad] in those countries where legislation or practice allow it. 2. The Catholic Church in Poland may organise assistance to support the activities referred to in paragraph. 1. 1. The State recognises the right of the Catholic Church to teach religion and the religious upbringing of children and youth in accordance with the beliefs of their parents or legal guardians. 2. The teaching of religion to children and adolescents, as an internal matter of the Catholic Church, is organised and carried out in accordance with the program set up by the competent authorities of the Church. 3. The teaching of religion is held in "catechetical places" organised in churches, chapels, church buildings or other facilities provided by their owners or administrators acting under their authority. 4. The Catholic Church also has the right to evangelise adults. 1. 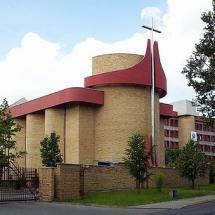 The Catholic Church in Poland has the right to establish and run higher seminaries and, in the manner specified in paragraphs 2 and 3, other universities. 2. Appointments at pontifical universities and the scope and mode of recognition by the State of their academic degrees and titles is specified by agreements between the Government of the People's Republic of Poland and the Polish Episcopal Conference, acting under the authority of the Holy See. 3. The creation by the Catholic Church in Poland of universitieswith curricula wider than that set out in paragraphs 1 and 2, requires the agreement of the Contracting Parties. The implementation of this agreement conforms to Polish law and the law of the Polish Church [Canon Law]. 1. The People's Republic of Poland recognizes the right of the Catholic Church to establish and operate schools other than those mentioned in art. 14, as well as educational and childcare institutions. 2. The types of schools and educational and childcare institutions, the rules and mode of their establishment and maintenance is regulated by Polish law. 1. The Catholic Church in Poland and its legal entities shall, in accordance with centuries of tradition, exercise the right to establish charitable care. 2. The Catholic Church is to carry out charitable care within the framework of its appropriate organisational structures. Those organisations have legal personality, referred to in Article 7. 1. Persons belonging to the Catholic Church have the freedom of association to carry out the tasks arising from the Church's mission within the framework of Church and Catholic organisations. 2. Organisations whose aim is formation of a religious system, or contributing to the development of religious worship, which are directly subordinate an appropriate Ordinary (Church organisations) operate under the ecclesiastical legal persons who have established them. These persons shall ensure the compliance of the activities of these organisations with their religious and moral objectives. 3. Organisations aiming at the socio-cultural and childcare activities in the spirit of the Church doctrine in communion with the Church hierarchy and with its approval (Catholic organisations) operate under the provisions of Polish law. In relation to these organisations, State authorities will carry out their responsibilities in consultation with the relevant Church authorities. The above arrangements also apply to the activities of charitable care under forms of organisation other than those referred to in Article 16. 1. The Catholic Church in Poland and its legal persons have the right to acquire, hold and dispose of movable and immovable property, manage their assets, and to acquire and terminate other rights, in accordance with Polish law. 3. The Catholic Church in Poland and its legal persons may, without the need to obtain authorization, organize voluntary public collection for its purposes. Guided by a special concern to ensure the proper conditions for the development of Christian culture, which is an integral part of national culture, the Catholic Church and the State authorities will work together to safeguard, develop and disseminate it. The High Contracting Parties undertake to resolve by diplomatic means any possible difficulties, which may arise in future, concerning the interpretation or application of the various provisions of this Convention. The authorized representatives of the Government of the People's Republic of Poland and the Conference of Bishops in Poland, while upholding the competence of the Holy See, will consult within the customary structures, matters relating to the Church and State. 1. Detailed agreements between the People's Republic of Poland and the Holy See and the Law on relations between the State and the Catholic Church in the Polish People's Republic [Rakowski Act] regulate matters not covered by this Convention. 3. The provisions of this Convention, become part of the national and ecclesiastical law. In witness whereof, the Plenipotentiaries of the Contracting Parties have signed this Convention. This Convention was prepared on ............................., ............... ............ ... ... in two copies, each in Italian and Polish, both texts being equally authentic. „Konkordat Polski 1993. Wybór materiałów źródłowych z lat 1993-1996". Wybór tekstów: Czesław Janik, Uniwersytet Warszawski, Instytut Nauk Politycznych, Warszawa 1997. "Konwencja między Polską Ludową i Stolicą Apostols".